The Mount Rosa Chapter NSDAR took on the challenge of restoring the bell; back to operating order as well as enhancing its presence within Denver’s Civic Center Park. Colorado’s Replica Liberty Bell is currently located on the Lower Capital Lawn in Lincoln Park, Denver. Our climate conditions and years of neglect resulted in a dire need to restore the bell’s mounting structure and preserve it for future generations. Mount Rosa Chapter NSDAR successfully spearheaded the drive to return the replica to a more stable, fully-functioning bell. It can now be rung on patriotic occasions and be preserved as a symbol of individual freedom for which our nation stands. In 1886, Congress authorized the construction of Fort Logan on a site chosen by Lieutenant General Phil Sheridan. Named for General John A. Logan of the Union forces, who led the US forces in the American Civil War. The fort was architecturally distinguished by its handsome field officers’ quarters designed in a modified Queen Anne style. After the post closed in 1946, Governor Stephen McNichols acquired a portion of it in 1960 for the Fort Logan State Mental Health Center. Other organizations, including Fort Logan National Cemetery, also occupy parts of the 980-acre site. Since 1994, nonprofit organizations and volunteer services have received grants to renovate the field officers’ quarters and convert it into a museum. Fort Logan is a special part of Colorado’s heritage. In 2017, Mount Rosa Chapter NSDAR made and hung cafe curtains, replacing the old ones. They researched and created a display from the memorabilia of SSGT Morris Lane from WWII that was donated by his step-brother. 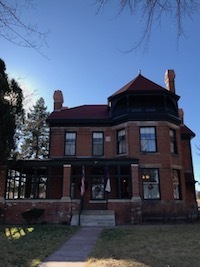 In 2018, Mount Rosa had the Fort Logan Field Officers’ Quarters designated as a DAR Historic Site; and planned a WWI display to commemorate the 100th anniversary of the Great War.